← Have you lost any possessions that you really cared about? What were they? Not feeling well. I have the end of a cold that has migrated to the lungs. Think I will soon be okay, however. Have to go to work tomorrow at State Dept. Working on the Columbia River Treaty. Not sure when or even if I will get paid. Life for WAE is uncertain these days. I voted in my first election in 1976 and was an enthusiastic Carter supporter. I changed my mind by 1980 and voted for Ronald Reagan. This book describes some of the events that changed my mind, and America’s. It both brings back memories and gives context I did not have at the time. The 1970s were a not pleasant. We had a continuing energy crisis, inflation & stagnation at the same time (stagflation), our foreign policy was in turmoil and Americans were divided. It was like today in the last aspects, but today we have solved the energy crisis and the economy is robust, which makes it much less depressing. Carter took over at a hard time and things did not improve under his leadership. Presidents get too much credit or blame for things that happen on their watch, but processes that started under Carter helped strengthen the economic boom of the 1980s, such as starting deregulating transportation and airlines, the Staggers Act that resuscitated American freight rail and strong anti-inflation actions by the Fed. None of this much helped Carter at the time, however, and he sure had his share of boneheaded economic plans. The book is not kind to either man. Kennedy is portrayed as a drunken lightweight. Carter is a man who thinks nothing is funny and is always sure he is right. According to the author, both improved after the 1980 defeat. The author speculates that Kennedy did not really want to be president but felt both pressures to do it and entitlement based on his family. After his defeat, he could apply himself to his Senate career. He remained a drunk and philander for years later, but it didn’t matter as much and, in the Senate, he became adept at passing legislation. Carter became perhaps the most active ex-president, working for a variety of causes, including almost eradicating Guinea worm. Carter was not well-liked by other presidents, including Democrats. He never quite overcame his self-righteousness and proclivity to interfere. 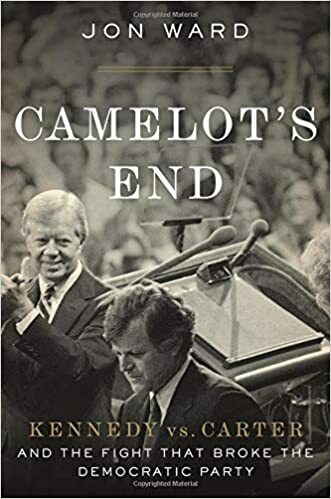 I learned a lot that I just didn’t know about Carter and some of what I didn’t know about Kennedy, although his life was better known. I felt some sympathy for Teddy. He was not groomed for the top-job and likely would have been happier farther from the spotlight. He was pushed beyond his abilities, but on the plus side, he responded reasonably well in later life. Carter was a drive man his entire life. He learned to hide his ruthless ambition behind a smile. His flaw, the one that caught up with him in the presidency, was his need to be in complete control. The book was very entertaining, especially the first half. I listened to the audiobook while driving and it kept my attention. The book was very entertaining, especially the first half.